Though not all are as selfish as this, it can seem strange to many that they ever endured the unpleasantness of student travel; the tents, the dirt, the non-air-conditioned rooms, the cheap airlines and – worst of all – the rucksack living. As a gentleman watches his four pieces of priority luggage scuttle around a carousel and wanders out to be greeted by his luxury hotel’s ebullient chauffeur, he must wonder how he ever enjoyed the life of a flip-flop wearing gap-year stowaway and, perhaps, descend into a moment of melancholia that he was once so happy with so little. Such sadness is often fleeting however, and the pang of it can be assuaged by knowing that he has never before been better prepared for the rudiments of globetrotting, despite the fact that what he once considered luxury is now necessity. As he has matured, the man of style has added to his domestic environment the accoutrements of his success. When he travels, he must leave these behind. Some are fortunate enough to be able to carry with them all that they need; a few are even more fortunate that they have everything they need waiting for them at their destination. However, it is fair to say that most will have the most ideal set-up at home and will have to take second-best when they travel. This is particularly true for those who prefer a luxurious, badger-brush shave with a weighty and significant razor. I used to think the travel shaving kit was a gimmick. The classic ‘one for home, one for travel’ marketing ploy. 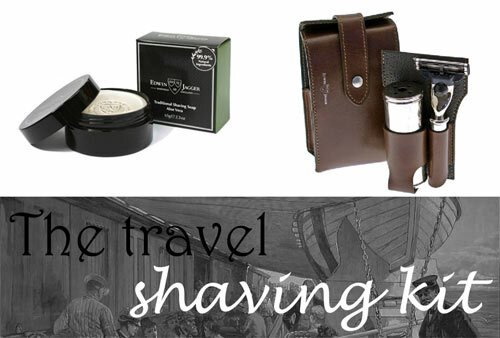 However, while a separate kit might not be utterly essential, the convenience of the shaving ‘travel tool-bag’ – particularly one which can be transported without the contents being damaged – is very appealing. The ideal of any grooming kit is to experience the same product abroad as at home. I don’t like shaving foam; shaving with a real badger brush and hard soap is my domestic experience and I am very reluctant to switch. The travel shaving kit from Edwin Jagger not only keeps your travel razor and brush together in a stiff, protective leather case, it also enables you to carry your elegant domestic grooming regime all around the world; the pure badger brush and Mach III (or Fusion) razor are both in gleaming nickel, belying their ‘take me anywhere’ utility and, when combined with the Edwin Jagger travel shaving soap, provides the user with a sense of home-from-home luxury not seen since the days of the portable drinks cabinet. I have a travel kit. Not small at all. But when you travel a lot you need to have one this kit may work for me as well for short trips and it looks cool.